The Atkinson Art Gallery sought clarification on the interior and costumes of a c.1730 painting attributed to the manner of Gabriel Metsu (1629–1667), held by them since 1904. A recent suggestion was that Joseph van Aken (c.1699–1749) is the artist: could any Art Detectives support this, or perhaps an alternative attribution? Foteini Vlachou based his identification on the objects represented, and suggested that the painting on the wall (on the left) of the interior could be the ‘Penitent St Jerome’, but the image’s low resolution made it difficult to identify clearly. He also drew attention to the distinctive carpet and wondered whether it is a Mughal? For Bart Cornelis the artist Matthijs Naiveu springs to mind, and he compared it with a painting in the Dordrecht Museum, Holland. Tony Campbell agreed with this suggestion. Lou Taylor’s speciality is clothing, and she dated the man’s wig to be c.1710–1130, and his coat to be around 1715–1725, because of the width provided by the pleats in the side seams, but the flares and cuffs did not appear to be of the same era. The women’s clothes were harder to date and could be around c. 1720. Patty Macsisak was intrigued by the kettle as the design seems out-of-place in a Dutch household, and could be perhaps a novelty from the ‘Far East’. A trawl of the internet did not produce any comparable examples, but she did mention a later and more elegant example from the early Georgian period, which she thought may be a copy. Vlachou conceded that Cornelis’s suggestion about the painting on the wall (on the left) seems very pertinent, and is comparable to another painting by Naiveu, where the same picture is used. This time he thought that the painting is a representation of ‘Lot and his daughters’ rather than a ‘Penitent St Jerome’ as he originally suggested. Cornelis confirmed it is the same picture in the background, Eddy Schavemaker agreed and refers it to a Niveu specialist, Tim Llewellyn, who supported all the findings that the painting is by Matthijs Naiveu: not his best work, but typical of his manner. Amanda Draper thanked all the contributors and forwarded their recommendation to the team in North West England and Cumbria, who in turn recommend that the attribution be changed to Matthijs Naiveu, with an execution date of c. 1720. 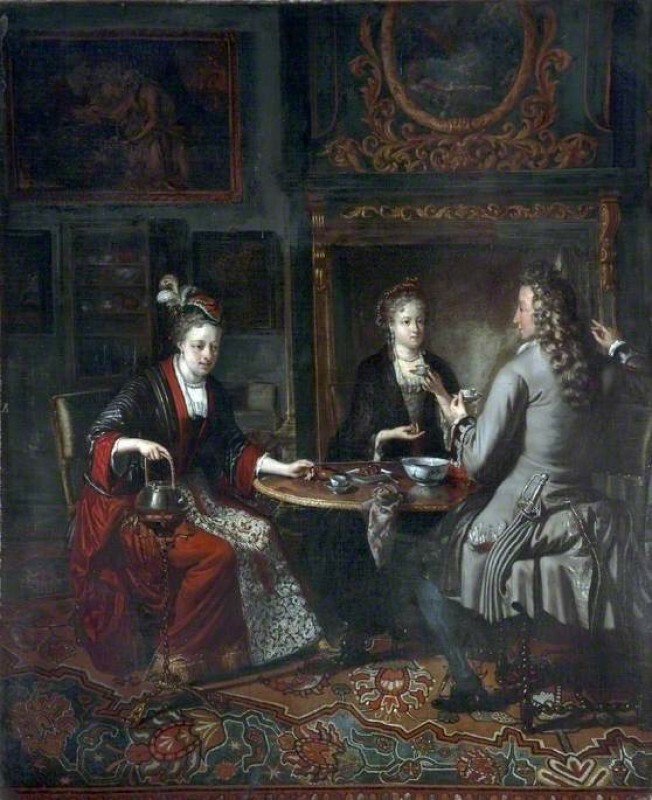 The interior and costumes in this painting suggest c.1730: could the artist be Joseph van Aken?